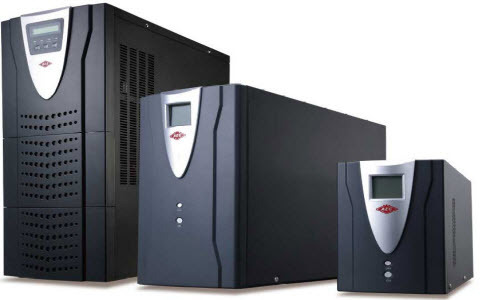 The full form of the UPS is an uninterruptible power source or uninterruptible power supply. It is an electrical device, gives emergency power to various loads when the input power typically fails. A UPS fluctuates from an emergency power system in that it will deliver near-instantaneous safety from i/p power interruptions by providing energy stored in batteries, super capacitors. The run time of battery for most UPS is relatively short but enough to start a standby power source. 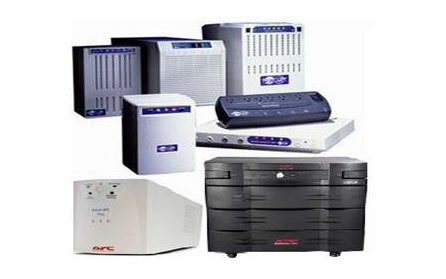 The main purpose of a UPS is to provide a protection to the equipments like computers, electrical equipment, computer and data centers when there is a power disruption. This device keeps a computer running for a few minutes after a power disruption and protects the data in the computer. In present days, there are various types of UPS systems coming with software component that enables you to automobile backup in case there is no power disruption when you are away from the computer. The circuit diagram of the UPS is shown below, which shows how the batteries in the equipments controls during a power disruption. The input voltage of the primary winding of the transformer (TR1) is 240V. The secondary winding of the transformer (TR2) can be raised up to 15V if the value is at least 12V running 2 amps.The fuse is used to give the protection to the owl circuit from the short circuits. The electricity presence will cause the led1 to glow. The LED glows will set off upon power disruption and the battery of the UPS will take over. This circuit is designed to provide a more flexible pattern where it can be modified by using different batteries and regulators to offer regulated & unregulated voltages. Using two 12V batteries in series and a positive input of 7815 regulators, we can control a 15Volts supply. Electrical power supply intrusions can come in a different forms like surges, voltage dips, voltage spikes and harmonics. These troubles can cause serious damage to electrical gears, mostly during the production stages or critical processing of an action. To decrease the risk of power supply distortion, UPS systems are frequently integrated in electrical networks. Electronic power supply equipment makers can offer consistent, high-quality power flow for various electrical load gear and these devices are generally found in industrial processing applications, medical services, emergency gear, telecommunications, & computerized data systems. 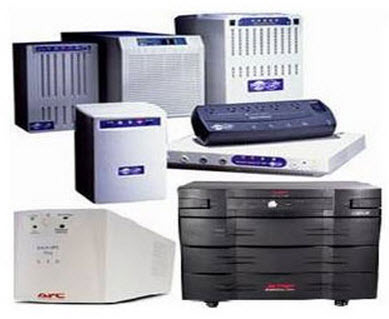 A UPS system can be a helpful device for ensuring accurate power supply performance. The standby Uninterruptible Power Supply is also called as off line UPS, that is generally used for PCs. The block diagram of this UPS is shown below. This UPS includes a battery, an AC or DC & DC or AC inverter, a static switch and a LPF which is used to decrease the switching frequency from the o/p voltage & a surge suppressor.The standby UPS system works with the switch arrangement to select the AC i/p as a primary power source, and interchanging to the battery & inverter as backup sources in case of primary power gets disrupted. The inverter normally relies on standby, only triggering when the power fails and the transfer switch routinely switches the load to the backup units. This kind of UPS system offers a small size, high degree of efficiency, & pretty low costs, making of this UPS is easy. The online UPS is also called as double conversion online uninterruptible power supply. This is the most commonly used UPS and the block diagram of this UPS is shown below. The designing of this UPS is similar to the Standby UPS, excluding that the primary power source is the inverter instead of the AC main. 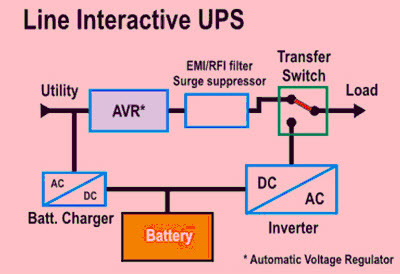 In this UPS design, damage of the i/p AC does not cause triggering of the transfer switch, because the i/p AC is charging the backup battery source which delivers power to the o/p inverter. So, during failure of an i/p AC power, this UPS operation result in no transfer time. 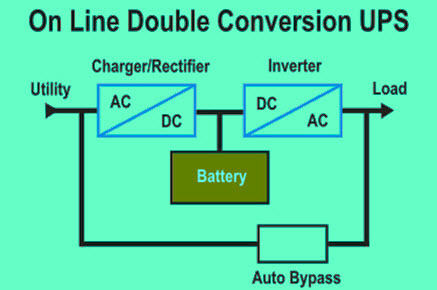 In this design, both the inverter and the battery charger change the total load power flow, resulting in reduced efficiency with its associated increased heat generation. This UPS affords nearly perfect electrical o/p performance. But the constant wear on the power components decreases reliability over further designs and the energy spent by the electrical power inefficiency is an important part of the life-cycle cost of the UPS. Also, the i/p power drawn by the large battery charger has been frequently non-linear and can interfere with the building power wiring with standby generators. 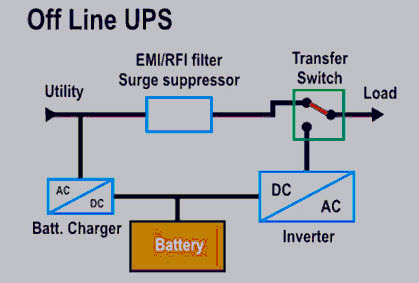 This is all about what is UPS (Uninterruptible Power Supply), circuit diagram of UPS with explanation, types of UPS. We hope that you have go a better understanding of the concept of UPS. Furthermore, any queries regarding this topic or electronics projects, please give your feedback by commenting in the comment section below. Here is a question for you, what are the applications of UPS? This article is very helpful, thank u. My question is about online UPS and specifically about the relation between input current and output current,is is necessary to be the same? Or which deference is expected?